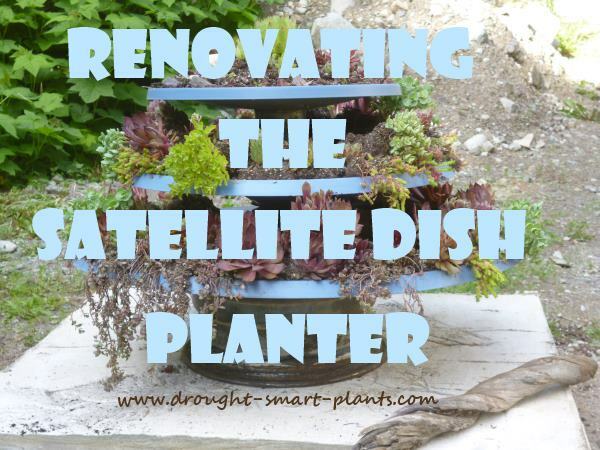 After watching it struggling along for a while, I realized it was time to refurbish the three tiered satellite dish planter - and not a moment too soon. 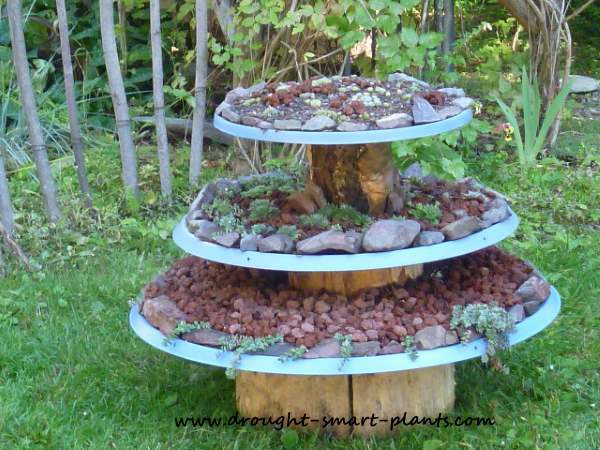 In the lawn, with pieces of tree to hold up the layers, this worked for a while, but it was by no means as stable as it should be, because of the convex shape of the dishes - they're not really round, more like oval so they're very tippy. It was only when it dumped out all over the place that I realized the moldy and mushroom encrusted log holding it up was so rotten. It's a good thing no-one was standing nearby. I decided that it should really have a better stand; luckily, there was a concrete pad that we poured from excess cement when we built our tiny house last fall. It is right in the wrong spot, but of course it's too heavy to move. What were we thinking? 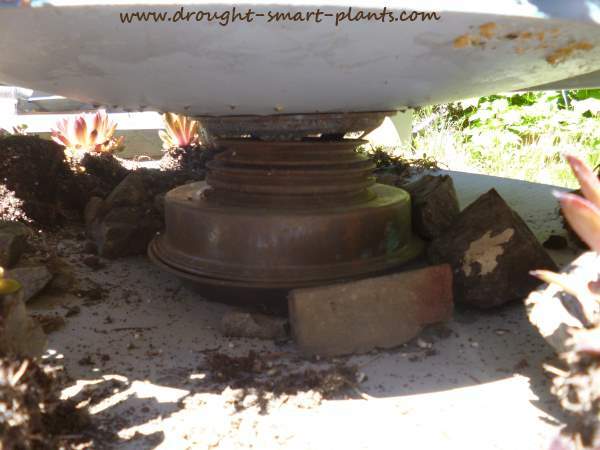 However, it's in exactly the right place to use as a platform for the newly renovated planter. I leveled it off by prying up one side and shoving flat rocks under it. That was a feat of engineering, because it must weigh 300 lbs, and I was alone at the time. That's where pry bars come in handy. 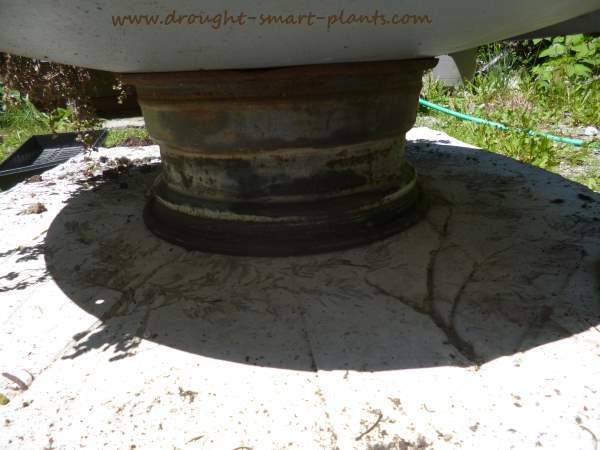 For the base, I found a truck rim - perfect; it's got a hollow center so the curved part of the biggest satellite dish can fit into it firmly so it's secure. The middle one is a pulley of some kind - very thick and heavy. 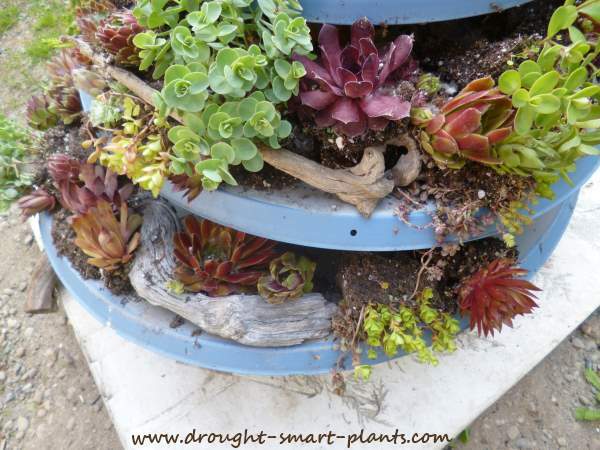 It wasn't quite tall enough to have room for the plants so I placed it on a copper chafing dish that needed a home. 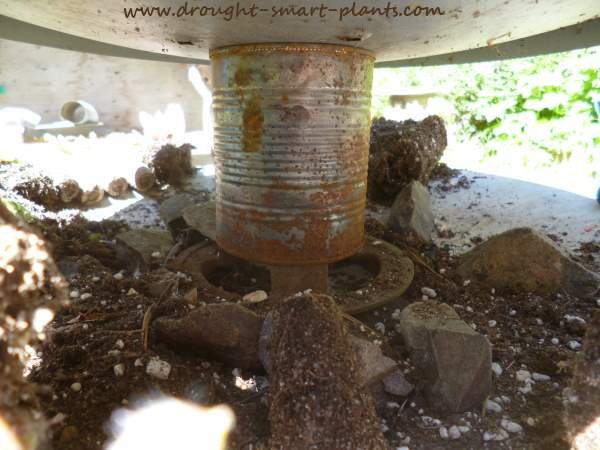 The top one is the inside part of the pulley, with a tin can (both top and bottom removed) that had been rusted in the fire. The important part is that they have to be level and secure, so as not to fall. 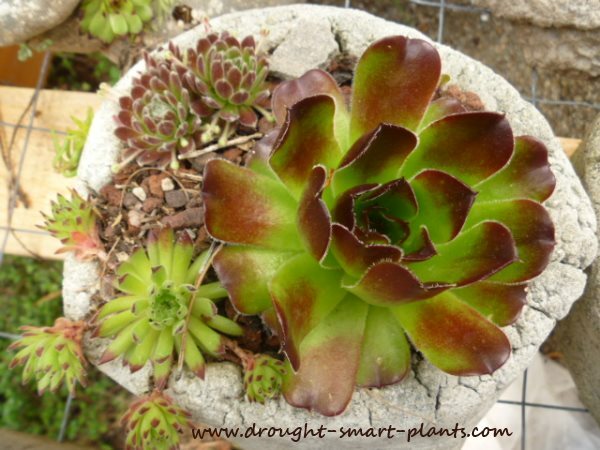 The weight of the plants and soil can be quite a bit when it's wet. 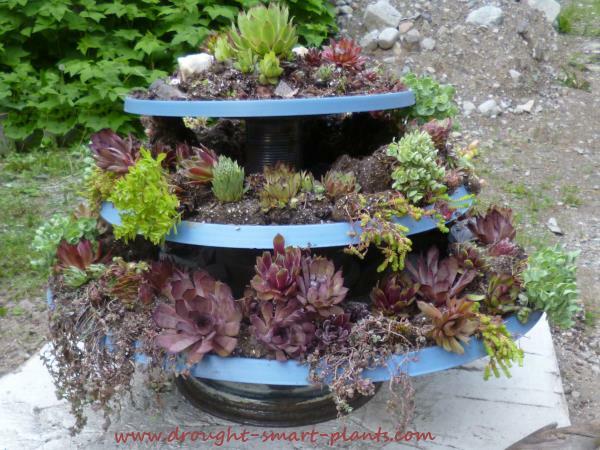 Filling in the spaces between each was fun; lots and lots of Sempervivum and Sedum drip off the edges. I think it will be so beautiful when the plants fill in a bit. The soil I used was simply what was already in the dishes; Sunshine Mix #4 mixed with some sandy garden soil, and then mixed with the lava rock that originally was used as mulch for the dishes. And there's lots of that to be had. 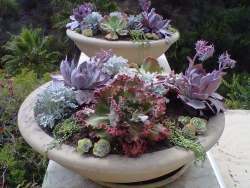 Take the Succulent Crafts E-Course from the comfort of your own home and make some really unique and different crafts to display your succulents in. 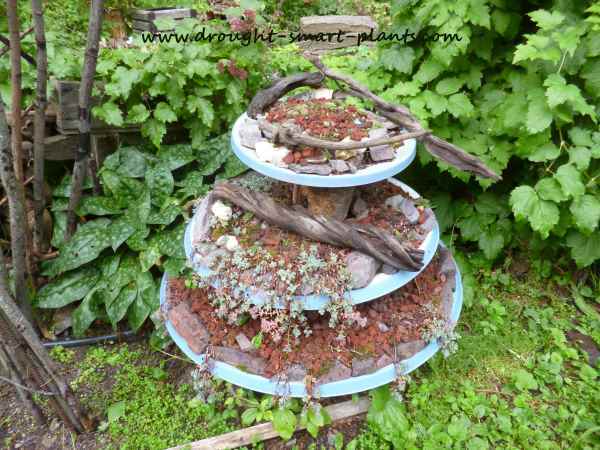 Also included are tips and hints for selecting the right plants for your crafts, and secrets of how to plant them too.